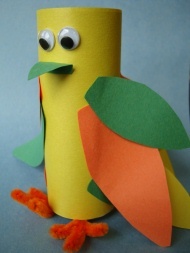 This TP Roll Parrot is a fun and colorful Bird Craft for Kids, suitable for Preschoolers on up. This would also make a great Pirate craft. After all, what's a Pirate without his companion! 1. Prepare your materials. You will need to cover your TP roll with a colorful parrot color. You can use our template to cut a rectangle that you can glue around your roll, or you can paint it. Cut out colorful feathers. 2. Glue your feathers all over the sides and back of the tp roll. Hint: sometimes it's easier to start at the bottom of the roll and work your way up! 3. Cut a small triangle out of a piece of green paper. Fold it over at the end and glue it onto your roll for your parrot's beak. Glue on your google eyes (or draw them on with a black marker). 4. If you want to put feet on your parrot just shape a pipe cleaner and glue onto the inside bottom of your parrot.